The sun is a very important element for our health because it allows the photosynthesis of vitamin D and works as a natural antidepressant. However, exposure to the sun requires adequate protection to protect our skin from its potential harmful effects. Thanks to the melanocytes, highly specialized cells present in the basal layer of the epidermis, our skin is able to protect itself naturally by producing melanin, a molecule able to absorb most of the UV rays and responsible for tanning. However, this perfect natural mechanism becomes insufficient in the case of prolonged sun exposure and over the years, when the number of active melanocytes able to protect us decreases. The natural photoprotection must therefore be integrated with products able to enhance the systems present on the skin both with the application of adequate cosmetics , containing filtering molecules, and internally with the intake of foods rich in antioxidants , such as vitamin C, vitamin And, beta-carotene, lycopene and so on. The sunscreen products guarantee a protection extended to the whole ultraviolet field and limit the skin damage that may derive from exposure to UVA rays, responsible for premature aging of the skin and the onset of melanomas, and UVB, which cause burns and rashes. 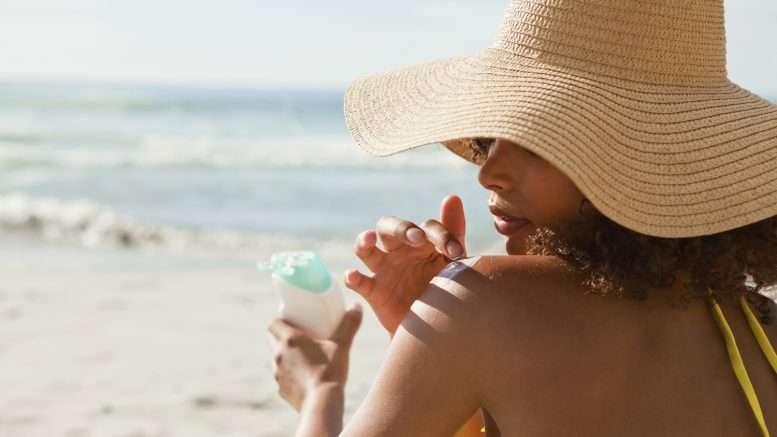 According to their mechanism of action, sunscreens are classified into chemists and physicists, but it should be noted that these are synthetic chemicals in both cases. The chemical filters, whose action mechanism is similar to a spring, are molecules capable of absorbing part of the energy of the radiation and then re-emitting it under other forms (vibrational, rotational, infrared). Many chemical filters are however photo- stable: in explicating their protective action they undergo structural transformations that alter their filtering characteristics and their protective capacity; they can also give rise to degradation processes that are damaging to the skin, which are caused, for example, by common photosensitization reactions (erythema). Thanks to research, new “photostable” chemical filters have been developed in recent years, although old “photo-stable” filters are still widely used. In any case there is not enough experience deriving from the use of these new sunscreens and therefore a certain caution is advisable, especially for children. The physical filters, the only ones to be admitted in the “ecobio” cosmetics, are inorganic molecules based on derivatives of metals (zinc oxide, titanium dioxide) and act as mirrors, reflecting the UV rays on the skin surface. The disadvantage of the physical screens is that they make the product rather pasty, difficult to spread and absorb, and for this they give a “bleached” appearance to the skin and an uneven tan, with more or less pigmented areas depending on how it is the product has been applied. Continue Reading: Summer clothes to wear when it’s hot! This is why today most producers use zinc oxide and titanium dioxide in micro or nano form, which make the product transparent and easily spreadable. To overcome the instability of micro and nano particles, which in contact with the solar radiation they generate free radicals which are harmful to the skin, the latter being coated with substances such as alumina, stearates or dimethicone, making the product no longer ecodermocompatible and eco-sustainable. Furthermore, on the man, the effects of these small particles, which are absorbed on a systemic level, reaching tissues and organs, are not yet completely clear. The SCCP considers them to be safe 2 but it is better to prefer the micronized forms 3 which have less problems because the particle size is greater. The sun is a natural element of extreme importance and solar exposure has numerous positive effects on our health; allows the photosynthesis of vitamin D, essential for a correct mineralization of bones and teeth, improves some skin diseases, such as eczema and psoriasis, and also acts at the nervous level acting as a natural antidepressant. For adults, the best thing would be to gradually activate the natural photoprotection of the body exposing itself to the sun starting from the spring months, avoiding the central hours of the day and taking daily foods rich in antioxidants. Walking around the city, for example, is a great way to get your skin used to the sun and enjoy all its benefits at the same time. In summer at the seaside, but also in the mountains or in the countryside, it is necessary to apply a good sunscreen. Whether you opt for a product based on chemical filters, physical filters or both, it is clear that solar remains a necessary compromise because the advantages it offers are much greater than those resulting from exposure to the sun without protection adequate, especially when you are on vacation for a few days and you tend to make the most of all the hours of sunshine possible to have fun, relax and get a tan. Are rich in antioxidants such as gamma oryzanol, vitamin C, green tea, carrot extract, vitamin E, resveratrol, which can counteract the formation of free radicals and enhance the action of sunscreens. Remember then that it is essential to wash away the sunscreens carefully from the skin at the end of the day, using cleansing creams for both the face and body, to effectively remove even the physical filters, otherwise not soluble in water. Be the first to comment on "Exposure to the sun without risks"